It hardly seems that long since the 2011 Eurovision contest and yet we’re now already looking ahead to another one, with four countries having selected their entries for the 2012 contest as of tonight and the allocation draw for which semi final each country will be in (apart from the Big 5 and the hosts, Azerbaijan. who automatically qualify for the final) has been made. As is traditional now, Ireland would seem to have drawn the short straw in terms of semi final allocations, being drawn to compete in the first of the semi finals on Tuesday 22nd May with seventeen other countries and with relatively few “friends” amongst these and the Big 5/host countries drawn to vote in this semi final. 1. Montenegro: Europe’s newest state has had the opportunity to vote for Ireland in Eurovision semi finals/finals on just two occasions – the 2007 final and the 2008 semi final and awarded Ireland a sum total of one point across those two contests. Then again, given that the two acts involved were Dervish and Dustin the low Montenegrin scoring might be somewhat understandable! Montenegro didn’t compete last year so no basis as yet for determining whether Jedward has appeal for the Montenegrins. With none of the other Former Yugoslav countries competing in the semi final (meaning these will not be competing for the Montenegrin vote) this does however raise the hope that Jedward might “get something” from Podgorica. 2. Iceland: As part of the Nordic voting bloc that Ireland finds itself in, we would be hoping for a good vote from Iceland. Alas Iceland has tended to be by far the least generous of the different Nordic bloc members, awarding Ireland 1.0 points on average across the contests that Iceland had opportunities to vote for Ireland in. Having tended to avoid Iceland somewhat in recent semi final draws, Ireland has had the opportunity to earn points from Iceland on eleven occasions with the most popular Irish act proving to be Jedward, who took four points from Iceland in 2011’s final. That 2011 vote leaves some hopes for a healthy points tally for Jedward from Reykjavik but it would appear unlikely to be the elusive douze points. 3. Greece: Since 1998 Greece has had twelve opportunities to awarded votes to Irish Eurovision entries. Since 1998 Greece have failed to award any points to an Irish Eurovision entry. So? Twelve points from Athens to Jedward this year? Er, probably not… even one or two points from Athens would be a bonus based on recent voting history. 4. Latvia: Ireland stands badly in need of friends in this semi final. Fortunately, the other remaining countries in our semi final draw are amongst our friends in the Nordic bloc of Eurovision voting countries. Latvia has proved to be one of the least generous countries to Ireland amongst this bloc and the least generous of the three Baltic states in this bloc up to last year’s contest despite Latvia scoring well from Irish televoters in contests over the 2000s. That said, we have got some points off Riga in recent contests – not much but still some. Having joined Eurovision for the first time in 2000, Latvia has had the opportunity to vote for Ireland in Eurovision semi finals/finals on nine occasions over the 1998-2010 period and gave us a total of 15 points (out of a maximum of 84). This was not an amazing tally by any means, but admittedly better than a lot of other countries voting in this semi final. Most of these Latvian points have been won by Sinead Mulvey (5 in 2009) and Brian Kennedy (getting 4 points from Latvia in both the semi final and final in 2006). However Latvia came good for Ireland in 2011, awarding Jedward ten points in both the semi final and final in Dusseldorf, meaning that we now have attained a most respectable 35 points on eleven occasions from the good folk of Latvia. This also means that Latvia must be one of Ireland’s best hopes for a healthy Eurovision points tally in this semi final and one of our better hopes (along with Denmark) for a douze points tally, though a low-points or no-points tally from Riga could well spell an early exit from Baku from Jedward. 5. Albania: Eurovision contestants since 2004, but do seem to end up in Ireland’s semi final on a fairly regular basis. Albania has had the opportunity to vote for Ireland in Eurovision semi finals/finals on eight occasions and have given us a total of 13 points (out of a maximum of 96) over these years, including Dervish’s sole points tally from the Albanian jury vote (5 points) in the 2007 Helsinki final. Jedward won no points from Albania in last year’s final and the fear exists that a similar result may be evidenced in 2012, althougn as with Montenegro Jedward’s chances here may be helped by the fact that most of the Former Yugoslav countries are competing in Semi Final 2. 6. Romania: Given the points records for the countries listed up to now, Ireland at this stage is sorely needing a Eurovision friend. As it stands, Romania is probably one of our “better friends” in this semi final. Romania has had the opportunity to vote for Ireland in Eurovision semi finals/finals on twelve occasions over the 1998-2010 period and have given us a total of 21 points (out of a maximum of 120). That’s not a great tally by any means. Dawn got 8 points from Romania in 1998, but since then our best votes from Romania have come in semi finals – 5 points (Donna and Joe McCaul) in 2005 and 4 points (Niamh Kavanagh) in 2010. However….and this is a big however…no points from Romania went to Jedward in the 2011 semi final and final. However, in the spirit of canny campaigning Jedward did perform at the Romanian national selection this year – could this trip to Bucharest pay off in terms of Eurovision points? 7. Switerland: “Don’t forget the Swiss” croaked Dustin in 2008. Blithely ignoring the fact that they weren’t voting in his semi final and they didn’t even get a chance to forget next Christmas’s main course. That said, based on past voting patterns the Swiss would be one of our main hopes for serious points in this semi final, having awarded Ireland 33 points across ten contests since 1998, but they tend to show a preference for the traditional Irish ballad with most of these points having been won by Toal, Kennedy and Niamh Kavanagh (who took the douze points from the Swiss in the 2010 semi final) and Jedward left the Swiss voters cold last year. Was last year a temporary blip in what amounts to generally good Swiss relations with Ireland in terms of all things Eurovision or have the Swiss voters only got time for the traditional Irish ballads? If the latter, then Jedward could struggle again to win points from Switzerland this year. 8. Belgium: Having had the opportunity to vote for Ireland in Eurovision semi finals/finals on eleven occasions, Belgium had only given us a total of 12 points (out of a maximum of 132) over the 1998-2010 period, but Jedward took a further twelve points from Belgium across last year’s semi final (5 points) and final (7 points). Eamonn Toal (2000) got four points from Belgium and Dustin the Turkey (2008SF) also got 4 points from Belgium, so the Belgians tend to veer towards the, erm, less traditional Irish Eurovision fare. (Note: I am not insinuating that Eamonn amounts to “less traditional Eurovision fare”). On the basis of this, Jedward would be hoping for – and possibly needing – a healthy points tally from Belgium in this semi final. 9. Finland: Finland has awarded Ireland twenty two points on the ten occasions that they have had the opportunity to vote for Irish entries in contests held since 1998, including ten points for Jedward in last year’s final. Ultimately Jedward will be needing a good vote from Finland in this year’s semi final to hold any realistic hopes of making the cut and the final; a low points tally (or worse still, no-points tally) from Helsinki and our Eurovision hopes may well be over for another year. 10. Israel: Prior to 1998, Israel statistically was the country least likely to award Eurovision points, but as times got hard for Ireland in the late 1990s and 2000s Israel have become a more generous source of Eurovision relative to other countries’ generosity levels. Israel have had the opportunity to vote for Ireland in Eurovision semi finals/finals on fifteen occasions and have given us a total of 19 points (out of a maximum of 132) over the 1998-2011 period. Could be worse but still not great. Our best vote tally from Israel came in last year’s final when Niamh Kavanagh got 6 points from Israel (only the UK and Switzerland were more/as generous) in a contest where the Irish vote was very much dominated by points coming from the “old Eurovision” states. Israel did not vote for Jedward in the 2011 semi final or final and a similar vote pattern could well emerge this year. 11. San Marino: With just two entries from San Marino to date, San Marino has only had two chances to vote for Irish entries but spurned the opportunity to vote for Dustin in Belgrade’s 2008 semi final and Jedward in last year’s final. So Ireland have yet to win any points from the San Marinese! Not good… It is admittedly a trend just based across two different contests and thoughts of their own credibility-challenged entry this year may lead the San Marinese voters to think more kindly of all things Jed-ish. 13. Denmark: At this stage Ireland stands seriously bereft of friendly faces who may cast us a few Eurovision points! Fortunately Denmark (obviously still feeling bad about all the pillaging back in ye olde Viking times) are one of our better friends in terms of awarding us Eurovision points, only surpassed by our good neighbours in the United Kingdom. We too respond in kind and Danish acts have scored well in terms of winning points from Ireland in recent Eurovision contests. The Danes have had the opportunity to vote for Ireland in Eurovision semi finals/finals on thirteen occasions over the 1999-2011 period and have given us a total of 55 points (out of a maximum of 156). This is as good as it gets in this semi final. Sinead Mulvey got 10 points from Denmark in 2009 as she narrowly missed out in the Moscow semi final, Niamh Kavanagh got 6 points from Denmark in last year’s semi final but then got no points from Denmark in the final, with Brian Kennedy getting 5 points from Denmark in both the semi final and final in 2006. But Denmark really came good for Ireland in 2011 when Jedward earned 12 points from Denmark both in the semi final and the final! Love you Denmark! On that basis, and especially based on the 2011 votes, Ireland should expect a healthy number of points from Copenhagen – anything less than 6, 7 or 8 points from Denmark and it will truly be sayonara Jeds. 14. Russia: Russia has had thirteen chances to vote for Irish entries since 1998 and over these thirteen occasions have only managed to award one point over this time period to an Irish act – to Brian Kennedy ( in the 2006 semi final). From Russia with love? Ha ha ha ha… Again, this is another country that Jedward will struggle to win any Eurovision points from. Even one or two points from Moscow would have to be viewed as a bonus here. 15. Hungary: Occasional absences from the contest during the 1990s and 200os means that the Hungarians have had few opportunities to vote for Ireland in the Eurovision semi finals/finals since 1998 – just five occasions in all, in which they have given us a sum total of 16 points (out of a maximum of 60). Not too bad!!! Hungary awarded the McCauls a whopping ten points in the 2005 semi final and Dawn in 1998 took six points from Hungary, but the last three Irish entries that Hungary could have voted for (including Jedward) failed to register any points at all. If last year sets the precedent then there could be bad news for Jedward here, but hopefully Hungary will remember their love for Donna and Joe and send a few points in Ireland’s direction this year. 16. Austria: With an on-off relationship with Eurovision over the past decade or so culminating in a break from the contest of four years ahead of the 2011 contest, Austria has only had the opportunity to vote for Ireland in Eurovision semi finals/finals on eight occasions from 1998 onwards but have only given us a total of 8 points (out of a maximum of 96) over these years. Not good. Only two Irish entries – Millenium of Love in 2000 and Lipstick in the 2011 Final (winning four points in the final but no points in the semi final!?) – have posed any interest for the Austrian voters. The fact that Jedward attracted some points off Austria in last year’s final (but not the semi final) may offer hopes of getting some points here. 17. Moldova: Have had the opportunity to vote for Ireland in Eurovision semi finals/finals on eight occasions but have only given us a total of 3 points (out of a maximum of 96) over the years. Not good. Our best ever vote from Moldova came in the 2009 semi final when Sinead Mulvey got 2 points off the Moldovan televoters. Jedward failed to take any points from Moldova in last year’s final. Not a great precedent here for hoping for many points for Jedward from Moldova. Jedward perform last in Semi Final 1 (18th position). So what of the Big 5/Host countries who have been drawn to vote in our final? Alas for Ireland, our most generous supporter by far amongst the Big 5 is the United Kingdom (who are indeed our most generous supporter out of all the Eurovision countries) and they will not be voting in our semi final this year (in 2010 the UK votes were crucial in getting Niamh Kavanagh out of her “group of death” semi final in Oslo). We also miss out on the Germans, who had been cool towards Irish entries up to 2010 but really loved Jedward, to the point of awarding them 8 points in both the 2011 Dusseldorf semi final and final. We’ve also missed out in the French…well, with just a miserable 6 points on fourteen occasions from France (and this a country that still owes Ireland big time after letting us down in 1798!!!) we won’t be crying any tears over that. So who did we get? Performing 10th in the Final – Italy: Having stormed out of Eurovision in a huff in 1997 the Italians were non-runners until their return to the contest last year where their poor Buble pastiche bizarrely finished second in the final, mainly thanks to the jury votes. Mamma Mia! Italy did not have the opportunity to cast a vote for Ireland during the televoting era up to last year’s contest, Cosa posso dire! The last time that Italy got a chance to vote for Ireland was in the 1997 contest in Dublin when the Italian jury awarded Marc Roberts 10 points. Italy hence has only had two oppurtunities to vote for Ireland since 1998 and missed out on the opportunity to award any points to Jedward both in last year’s semi-final and final. Great to have you back ragazzi – not… If last year sets the precedent, there may be niente da avere from Rome again this year. Performing 13th in the Final – Azerbaijan: Azerbaijan is probably the most remote country in Eurovision-land in relation to Ireland and our points haul from the Azeris has tended to reflect the distance, with relatively few points going to Ireland across the different contests that Azerbaijan have had the opportunity to vote for Ireland in. As one of the newer Eurovision states (having competed just over the past four years, but finishing in the Top 10 in each of those years and Top 5 across the past three years), Azerbaijan has just awarded Ireland four points across the five occasions they have had a chance to vote for an Irish entry with all these points being won by Niamh Kavanagh in the 2009 semi final. This does raise some hopes that Jedward might get some of the lower Eurovision points from Baku in a semi final when Azerbaijan cannot vote for Turkey and some of the Former Soviet states, but they are unlikely to take very many points from Azerbaijan. Performing 19th in the Final – Spain: Spain has had fourteen chances to vote for Irish Eurovision entries since 1998 but had spurned most of these opportunities up to 2010, having awarded Ireland a total of only four points up to last year’s final. However, Spain awarded 7 points to Jedward in the 2011 final and this does raise some hopeful prospects for a similar result from Madrid for Jedward in this year’s semi final. If voting patterns in our semi final were to exactly mirror these past voting histories then the result would be as follows: 1. Greece 156 points, 2. Romania 123, 3. Russia 111, 4. Denmark 93, 5. Hungary 89, 6. Iceland 87, 7. Moldova 86, 8. Israel 78, 9. Albania 66, 10. Finland 65, 11. Latvia 55, 12. Belgium 49, 13. Cyprus 43, 14. Ireland 41, 15. Austria 22, 16. Switzerland 21, 17. San Marino 18, 18. Montenegro 11. This is obviously not good for Ireland, but it is worth noting that the analysis ahead of last year’s semi final portrayed Ireland as being in a much weaker position – the improvement in Ireland’s rankings in this analysis no doubt to a good extent reflecting the strong performance and vote-winning abilities of Jedward in 2011’s semi final and final. 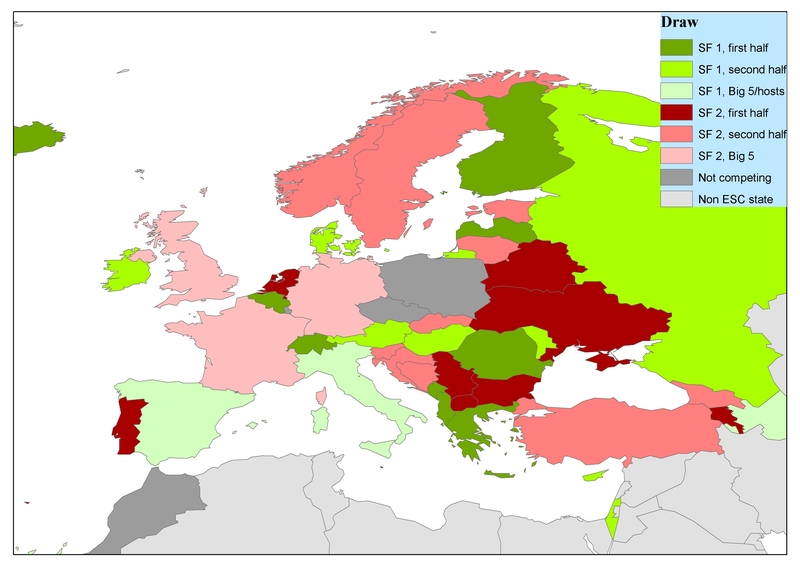 This also suggests that the mix of countries voting in our semi final, while not the array Ireland would have wanted, is slightly more favourable than it was last year, and remember last year Ireland did manage to make it out of the semi final (albeit by a narrow enough margin of 15 points ahead of 11th placed Belgium). Jedward were helped significantly in the 2011 semi final by an almost perfect draw position of getting to perform last on the night and having achieved the wild card in this year’s draw Ireland has won the same position again, so this draw position will signficantly help Jedward’s prospects of qualifying out of this semi final. If we go on the basis of points awarded to Jedward in last year’s final from the countries involved in this semi final (and acknowledging the fact that Montenegro were not involved in the 2011 contest), then Jedward would be expected to win a tally of 54 points. It is worth noting that three countries got exactly 54 points in last year’s semi finals; Moldova made the final from Semi Final 2 by just one point but Armenia and Malta both failed to make it to the final out of Semi Final 2. So, if Jedward fail to make “new friends” in this year’s contest, any loss in support from last year’s friends will prove terminal to their Eurovision prospects and make for an early exit from Baku. Using a similar analysis of past voting patterns for the countries that were drawn to participate in Semi Final 2 in January 2012 lead to a prediction that the result would be as follows: 1. Ukraine 122 points, 2. Serbia 114, 3. Sweden 107, 4. Bosnia and Herzegovina 99, 5. Turkey 93, 6j. Norway 90 and Armenia 90, 8. Georgia 81, 9. Croatia 75, 10. Malta 59, 11. FYR Macedonia 53, 12. Estonia 51, 13. Belarus 48, 14. Bulgaria 44, 15. Slovenia 37, 16. Lithuania 34, 17j. The Netherlands 31 and Slovakia 31, 19. Portugal 17. Armenia’s decision on 7th March to withdraw from this year’s contest means there will be the same number of countries now in Semi Final 2 as in the first one, but also means that in all likelihood there is now one extra slot in the final up for grabs given Armenia’s tendency to make the final in most years (with exception of 2011) and results arising from the analysis above. If Armenia were not to vote in the contest (as happened when Georgia ‘withdrew’/were excluded in 2009) then the new predicted voting figures based on past voting histories would read as follows: 1j. Ukraine and Serbia 119 points, 3. Sweden 107, 4. Bosnia and Herzegovina 104, 5. Turkey 100, 6. Norway 88, 7. Croatia 82, 8. Georgia 74, 9. Malta 63, 10. Estonia 57, 11. FYR Macedonia 53, 12. Bulgaria 47, 13. Belarus 42, 14. Slovenia 41, 15. Lithuania 38, 16. The Netherlands 32, 17. Slovakia 31, 19. Portugal 21. Looking at these figures and comparing these with the ones above (when Armenia was still included in the list of competitors) it is clear that the Former Yugoslav states are the big winners here – not losing too many votes due to loss of the Armenian vote (11 votes across the five Former Yugoslav states competing in this semi finals, as against a loss of 30 votes for the five remaining Former Soviet states) and gaining diaspora votes that would otherwise have been won by Armenia (this also applies in the case of Turkey). Overall, with Armenia no longer taking part the Former Yugoslav states combinedwould gain 21 more votes while the Former Soviet states combined would lose 6 votes. In this analysis the “spare” final slot would acutally go to a Former Soviet state, but with Macedonia just behind and with Slovenia also likely to figure, with a strong jury-friendly ballad as in last year’s contest when their entrant Maja Keuc won the jury vote in their semi final. The possibility that all five Former Yugoslav states could make it to the final in this scenario is a very live one. The overall losses for Former Soviet states are tempered somewhat by the fact that Baltic states such as Estonia and Lithuania haven’t tended to win too many votes from Armenia anyway and overall Estonia and Lithuania actually gain as a result of Armenia’s withdrawal. In terms of extra points, the big winners would seem to be Turkey and Croatia (seven more points, possibly securing the countries’ places in the final) and Estonia (six more points, pushing Estonia into the qualifying positions), followed by Serbia (five more points and increased likelihood of winning the semi final) and Bosnia (five more points and a place in the final probably secured), with four more points for Slovenia, Lithuania and Malta. The big losers here would be Georgia (seven fewer points), who would be likely miss out on the final for the first time if the jury vote did not favour them (and having listened to their 2012 entry this is VERY much a possibility) and Belarus (six fewer votes and less of a chance of making the final), with Ukraine likely to lose out on three votes and Norway losing two. If Armenia were to vote in the contest (as happened in 2006 when Serbia and Montenegro withdrew ahead of that state’s dissolution and following a fracas at the selection final involving Brian Kennedy (NB I mean that he sang at that contest, no that he involved in/was the cause of the fracas) but this was not the case when Georgia was excluded in 2009) then the new predicted voting figures based on past voting histories would read as follows in this case: 1. Ukraine 129, 2. Serbia 124 points, 3. Sweden 113, 4. Bosnia and Herzegovina 106, 5. Turkey 100, 6. Norway 95, 7. Georgia 86, 7. Croatia 82, 9. Malta 66, 10j. Estonia and FYR Macedonia 57, 12. Belarus 50, 13. Bulgaria 47, 14. Slovenia 41, 15. Lithuania 38, 16. The Netherlands 33, 17. Slovakia 31, 19. Portugal 21. The states most likely to gain if Armenia were to vote in the final would obviously be Georgia and Belarus, who both go up the rankings relative to the scenario where there is no Armenia vote, while Ukraine once again are identified as the sole winners of the semi final.